Let’s be honest. Van Staal is, and has been, the “gold standard” in fishing pliers for many years now, with very good reason. They don’t rust, they always grab, and always cut even the thickest line materials. They’ve even become an icon—he (or she) who sports the Van Staals on the belt clearly knows quality. I have a pair of Van Staals myself, and love them. It’s just that I love my Hatch “Tempest” pliers a little bit more. At face value, the benefit of spending $200 for a good pair of fishing pliers (Tempests) versus $350 (Van Staal) is obvious. But from a purely functional standpoint, I lean toward Hatch. Two reasons, really. I like having cutting jaws on either side of the pliers, because in the heat of the fishing action, I don’t like to be flipping sides. 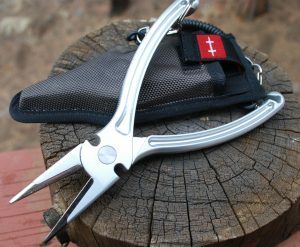 And the Hatch pliers are just a tad longer (7.5 inches versus 7 inches for the longer VS model), and that comes in handy, both in ‘cuda country and the pike world. I have fished the Hatch pliers in South America for dorado, throughout the tropics for bonefish, tuna, sharks, tarpon, and permit, as well as in the far north, places like Alaska for trout and salmon, and Lake Athabasca in Saskatchewan for trophy pike. They don’t leave my side, and they have not let me down. Cold weather, hot weather… salt, whatever. Stripers, sure. Carp—of course. They’re spring loaded, they’re light, and they are corrosion resistant. Cutting blades can be replaced, though I don’t see that happening in my case for some time. There are many options when it comes to pliers, but only scant few contenders when it comes to long-term reliability. And in terms of value, Tempest is in its own league.